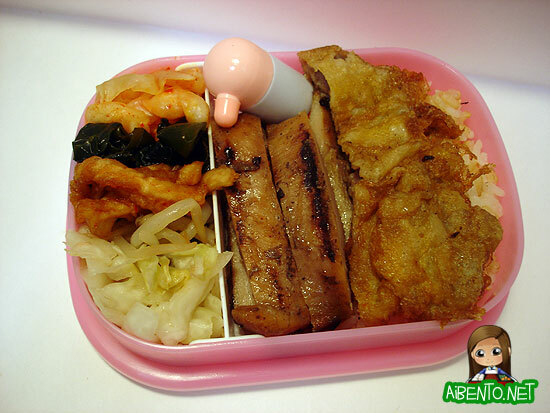 Ok I got all my emo out, on to the bento for today! We ate takeout from Kim Chee 7 last night and I took a piece of Mr. Pikko’s extremely oily but oh-so-good meat jun for my lunch. Kim Chee serves good everything. Their chicken is juicy and tasty, the meat jun is soft and well marinated, they have KILLER sauces, the shrimp tempura is HUGE and onolicious, and their soup and veggies are really good. My only “complaint” is that their cabbage and bean sprouts namul are nowhere near as good as Gina’s. I’ve eaten at Kim Chee 2 in Kaimuki and 7 at Westridge. I have no clue where Kim Chees 1, 3, 4, 5, and 6 are! Haha! 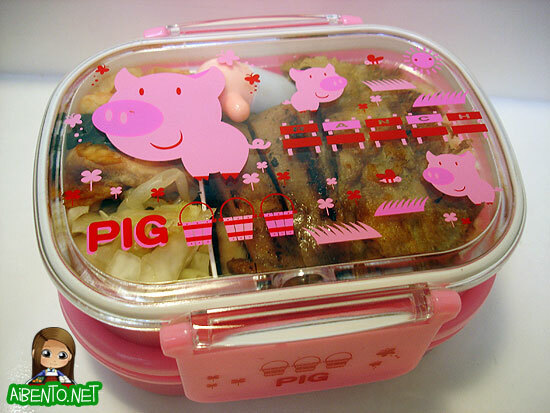 This is my other new box, a 2-tier piggie bento box! (pic below) It’s got a food divider, which I love. None of my other boxes have had them and I’m so giddy about it! This layer has my veggies tucked snugly into one side and that includes: cabbage, bean sprouts, daikon kim chee, seaweed, and kim chee. On the other side is more half brown half white rice with sliced BBQ chicken and the piece of meat jun. There is meat jun sauce in the little thermos. The lower layer contains my fruits which are cherries, kiwi, and some peeled lychee. If you’ve never had lychee before ohhh, it’s good stuff. The only problem is the peeling! Augh I hate it!! My dad will just bite into the shell and eat it like that but I find that so gross cause the shell is so bitter, yech!! But even though I like lychee a lot, I’ll take rambutan over lychee any day! This paragraph needs moar !! Here is the box all closed up and ready to go. Aren’t the lil piggies so cute? I still can’t believe I won this for one $5, what a steal!